The name “Reach” was chosen because we want our readers to think about all of the goals they aspire to reach – health, wellness, emotional, etc. – and we want to inspire them to reach those goals. Readers will notice that the magazine doesn’t have as many pages as it did before – that is because we removed all 10 pages of advertisements. We will continue to write stories featuring our patients and employees, and we will use our original photographs. If you have any comments about the magazine – or story ideas for future issues – we’d love to hear them. Please contact us at kim.haley@dignityhealth.org. 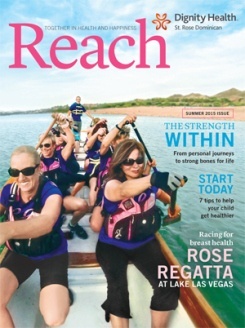 To view Reach online, visit strosereach.org.